Grab your six-shooter and head out into the desert heat, a-shootin' and a-firin' in Gunfighter's Ball. The game, originally successfully funded via Kickstarter, will be available tomorrow over on Knuckleduster Miniature's website tomorrow. The long wait is over! 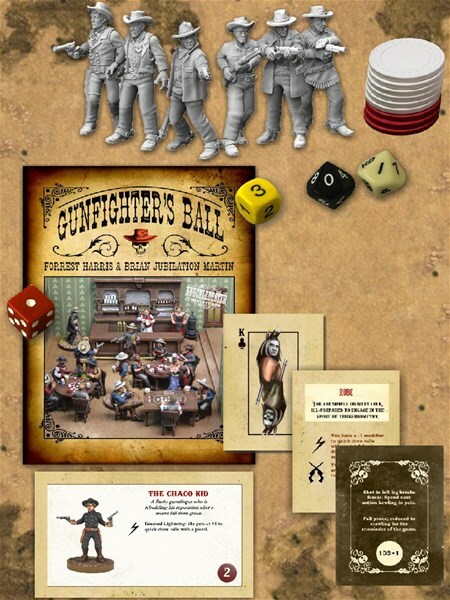 Gunfighter's Ball, the highly anticipated Wild West tabletop game system made possible by a successful Kickstarter at the end of 2017, will be released Saturday, December 15th by Knuckleduster Miniatures. Knuckleduster already produces a full range of models and terrain for the wild west under the Gunfighter's Ball product name, but this release substantially expands the line into a full-blown game system. Included in the release is a full-color, hardbound rule book, four decks of specialty cards for the game, as well as multiple new characters, buildings and other terrain, and a neoprene-backed cloth "mousepad" game mat the the basic underlying desert terrain (comes in 3x4' and 4x6' configurations). Follow the link for an article and video about the game.